I have been skiing vigorously all day, and I’m as tired as a dog – so what you’re getting here is going to be a spot shorter than usual. Veritable Quandary (VQ to locals) is a bar and restaurant serving killer-fantastic cocktails, and food which is thoroughly decent if not extraordinary. It’s right next to the Hawthorne Bridge in Portland, with an excellent view of the Willamette river. Look out for the portrait on the inner wall of the conservatory featuring someone looking like a female, Victorian Charles Atlas. The drinks are simply fantastic. At the top of the page is a VQ-8 – the house Bloody Mary, made with a home-infused beet vodka, making it a gorgeous, lurid magenta and giving the whole drink wonderfully earthy depth. Try the aromatic martini made with limoncello and a lavender-infused vodka (again, made in the bar) – wonderful stuff. Another time, I think I might be tempted to visit VQ for their drinks and bar snacks alone. I had one of those bar snacks as a starter – these dates (left), wrapped in pancetta and stuffed with goat’s cheese and Marcona almonds. Lovely sticky, sweet, salty, crispy, squashy things to nibble alongside a drink. Dr W’s snackish starter was a very tasty rabbit terrine (below), served with huge hunks of fresh, toasted brioche, a couple of mustards and some chutney. Main courses thrilled me less. Barbecued boneless beef short rib was always going to be unsophisticated, but the saucing was altogether too much, and the meat itself felt sad and overdone (although this could have been a result of a too-fierce sauce masking the joint’s own flavour). The barley risotto it was perched on top of, though, was great, full of chunks of apple and roast butternut squash. Dr W’s steak was…a steak. A perfectly nice steak, although we both felt we could have happily swapped it and the short rib for a few more of those far more interesting starters. Full of meat and cocktails, we had two $1 truffles for dessert. They were sticky, dense and coated the inside of your mouth beautifully. I’ve since heard from friends that other desserts are also great – the home-made ice-creams and sorbets (look for flavours like roasted hazelnut, spiced cider and red wine-pomegranate) and the souffles got a particular mention. Head to VQ for views, cocktails, dessert and nibbles – and, like many other Portland restaurants, uncommonly attractive waiting staff. What’s going on there? We pushed open the door to find a little room seating only 16, lighting that felt like a photographic darkroom, a blue fug of savoury, perfumed steam coming from the kitchen, a soundtrack of post-punk theremin music, and a TV balanced on top of the sake fridge showing a Japanese chef disembowelling herself. (Comedy, I think. These things don’t necessarily translate, but they’re sure as hell fascinating.) I am not usually prone to snap judgements, but from the moment the picture on the television changed to three rubberised Japanese zombies whose eyeballs kept falling out, I was pretty sure I was going to like Tanuki. The menu embraces Okinawan, Japanese and Korean dishes, all designed to complement (and get you to order more) sake and beer. If you’re familiar with Korean seasoning and heat, you’ll be at home with what’s going on on the plates here. What’s on offer changes daily, but you can expect to find tofu made fresh in-house, real grated wasabi, local and impeccably raised meats, home-made pickles and some extravagantly weird spicing on the list every day. Tanuki is pretty uncompromising; this is not a menu that panders to the daft and squeamish. ‘Crab brain’ miso, Japanese drinking vinegars and tiny duck hearts threaded on a bamboo skewer take pride of place. The bar is in-your-face scuzzy, the food designed to cram every taste bud you own with sensation. I chatted briefly with Janis about the off-beat setup here, and she mentioned something that drives me mad in Europe and clearly drives her mad in America too – the tendency of new ethnic restaurants to cater solely to high-end, top-class diners. None of your gleaming walls, shimmering waitresses and horrendously overpriced sushi here, more’s the joy. Somehow, I suspect that eel on a stick simply wouldn’t taste as good with a cloth napkin, anyway. Order sake, and plenty of it. We chose a Korean gukhwaju – a rice wine flavoured with mountain chrysanthemum. Those intimidating-sounding drinking vinegars are actually delicious, and are a good non-alcoholic way to calm burning tongues; there’s only the slightest hint at an acidic fermentation behind a sweet mulberry, plum or strawberry syrupiness that seems designed to quench and soothe. You can order directly from the menu, or pick a price-point for an omakase meal selected by the chef. We asked the waitress (helpfulness in human form – what I wouldn’t give for a dose of American service culture back in the UK) what sort of amount she recommended two hungry people spend, and she said that $20 a head should be plenty for a full meal. Ten courses later, we left reeling and plump. Two dollars a course per head! Dishes seemed to get larger as the night progressed. We opened with a soft and meaty hamachi tuna sashimi, seasoned with some of that fresh wasabi and shoyu. We’d barely finished it when a dish of creamy and impeccably fresh uni sashimi (alive, says Janis, until the moment she orders it), on paper-thin slivers of lemon with sweet soy and more of that wasabi arrived. 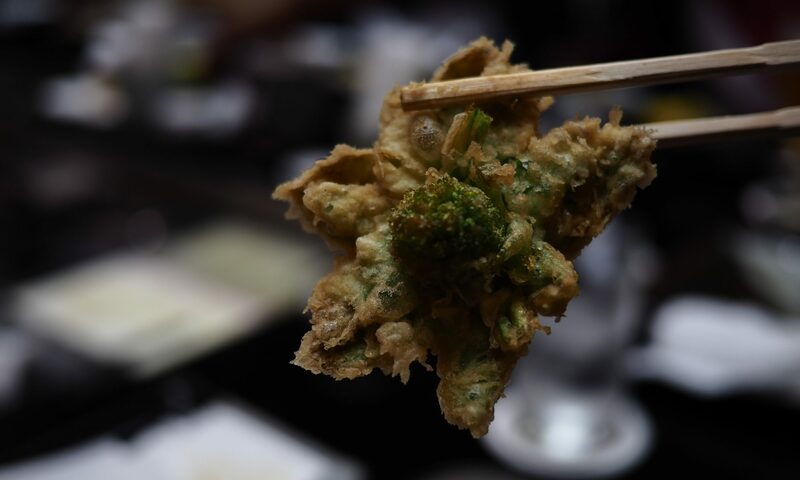 Hoshi kyui, a jellyfish, cucumber and wild herb salad in a hot and sour dressing, packed a fish-sauce umami bite that had us reaching for the drinks and then dipping straight back into the salad the moment we’d swallowed every mouthful. Skewered eel fillets in a sweet soy glaze, oily, salty and crisp, arrived fresh and hot from the grill, accompanied by some of the pickles that are made weekly in the kitchen. Nasu to ebi nikkei was one of the larger dishes, and came with pearl-like sticky, short-grain polished rice. Elegantly de-veined shrimp, so fresh that they gave to the teeth with a crunch, were poached in a cinnamon tea, and served with a miso-dense eggplant and bok choi preparation. Things were starting to get seriously spicy by now, and our thoughtful server arrived with a pitcher of iced water. The kitchen uses a huge number of different soy sauces. Shiro, tamari – you name it, it’s probably represented somewhere on the menu. We had two delicate, light meat balls made from wild boar, which came drenched with a gummy, sugary Korean soy. Suki wagarashi nearly had me beaten. These pork ribs, cooked until the meat was falling stickily and glutinously from the bone, were rubbed in a Japanese mustard and sesame marinade that packed so much heat that I stopped being able to feel my lips. Fortunately, the next couple of courses stepped back from the spice a bit – lonngganisa, a fatty, porky Pinoy sausage, came sandwiched between two deliciously crisp and cooling slices of fresh grilled lotus root. And joy of joys – a baked char siu bun. They saved the best, spiciest, saltiest and largest dish for last. Jajang bop – a huge claypot stuffed to the brim with steaming hot rice layered with shredded, salted, gelatinous pork, cubes of the kitchen’s fresh tofu and some unbelievably tasty fermented black beans. A raw egg lay on top with a generous portion of kim chee, dosed with a sinus-clearing amount of chillies, some fresh herbs and fat, long beansprouts. We stirred the bowl with chopsticks to scramble the egg through the hot rice, and kept on eating long after our distended stomachs and burning tongues were screaming to our brains to stop. The lighting (and my fear of chefly beheading – Janis seems quite strict) stopped me from taking any pictures of what we ate, but there are plenty on Tanuki’s own website if you want to get a feel for the look of things; they’re very accurate depictions of what you end up eating. I only get to spend about one week a year in Portland, if that, and it’s fast becoming one of my favourite cities for eating in the world. 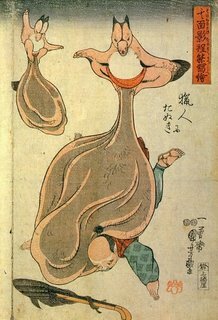 Something has to be done about this parlous state of affairs; I wonder how the guys at Tanuki would feel if I turned up in their garden with a raccoon-dog-scrotum tent and set up house? Regular readers will be aware that I’m a bit of a sucker for old recipe books – the odder, the better. Over Christmas, I was pootling around a second-hand bookshop in Yorkshire, when I came across this fabulously racist dust jacket. Flicking through it, I found some really interesting recipes, and started to wonder. Who was this Countess Morphy? Had she ever met a toque-wearing, pirate-earringed, Indian chef in real life? It was £8.50, so I snapped it up. A bit of Googling reveals that the author wasn’t a countess at all. Marcelle Azra Hincks, born in 1883, was brought up in New Orleans and moved to England some time in her early twenties. She published a few articles and a slim book on modern and foreign dance, and then reinvented herself as a food specialist, complete with a new pseudonym and made-up title. Calling herself a countess was a stroke of genius; the British love a titled lady, and Recipes of All Nations, published in 1935, sold in huge numbers, remaining in print for decades. There’s a proud little note in red inside the dust jacket: “This is the book that was consulted by the caterer to the London conference of the United Nations.” The book’s exotic credentials don’t stop there; Countess Morphy has drafted in the help of a Mr SK Cheng of the Shanghai Emporium and Restaurant in London’s Chinatown for her Chinese chapter; the proprietor of a London Greek restaurant and “former chef to members of the Royal Family of Greece” helps with the Greek chapter, and a friend at the Polish Embassy selects his favourite recipes for the Polish section. This book, with chapters on food from Equatorial Guinea (iguana fricassee) to Java, must have been outlandishly exotic in 1930s Britain – it was written more than ten years before Elizabeth David introduced Mediterranean cooking to wide-eyed Britain, at a time when we were all munching miserably on suet and mutton. Countess Morphy takes us on a tour of classical European cooking; the French chapter is the longest and quite gorgeous, full of dishes enriched with yolks and cream. Alongside all this, though, there’s a pleasingly complete treatment of Scandinavian cookery, with Norway, Sweden and Denmark meriting a chapter each. Eastern Europe is covered in detail too, and the Russian chapter (on which a Madame N Wolkoff from the Russian Tea Room in London consulted) has me salivating – sturgeon with sweet wine and cherries, beef Strogonoff and stuffed grouse with soured cream. A middle-class upbringing in New Orleans would have seen classical French food as standard, but there’s also a section towards the back of the book, quite distinct from the chapter on American food, devoted to the Creole cookery of New Orleans itself. I’ll leave you with Countess Morphy’s recipe for Creole breakfast fritters and its sadly nostalgic introduction – there’s something of a sense of homesickness in this recipe. These fritters, made from rice and raised with yeast are quite unlike anything I’ve come across before, but they sound delicious. Ingredients: ½ a cup of rice, 3 cups of water, 3 eggs, 3 tablespoons of flour, ½ a cup of sugar, about 1 oz or a little under of yeast, lard or oil. Method: Put the water in a saucepan, bring to the boil and add the rice. Boil till the rice is very soft and mushy. Remove from the saucepan and, when quite cold, mix with the yeast dissolved in warm water. Set the rice to rise overnight. In the morning, beat the eggs thoroughly, add them to the rice, with the sugar and flour. Beat all well and make into a thick batter. Set aside to rise for another 15 minutes. Have ready a deep frying pan with hot oil or lard, drop into it 1 tablespoon of the mixture at a time, and cook till a light golden colour. When done, remove them from the fat, drain well by placing them on a sieve or in a colander, sprinkle with sugar and serve very hot.